We are halfway through National Nutrition Month, but why not celebrate it in April too? Spring is a great time to focus on leading a more nutritious lifestyle, and promoting healthy eating can be a fun way to re-energize your corporate wellness program. Our partner, and fellow employee health and wellbeing leader, Castlight, agrees that warm weather is a great way to kick start healthy behaviors. While we know getting outside to exercise is a fantastic way to capture Spring’s energy, focusing our attention inwards and becoming more aware of what we eat helps build a solid foundation for total wellbeing. Many of us know nutrition is key to moving the needle on the scale. As multiple studies have shown, food is four times more effective than exercise for weight loss. But diet is as critical if you just want to become healthier in general. Many studies have demonstrated that diet is the leading factor in managing, treating, and even reversing chronic disease–all great reasons to kick off spring with corporate wellness activities that encourage healthy nutrition in the workforce..
Let’s get started. Here are six ideas to reinvigorate your employee wellness program. 1. Meatless Monday—Plant-Forward Monday doesn’t have the same ring to it as Meatless Monday. But that’s the idea. Organize a #MeatlessMonday Pledge, where employees commit to having plant-rich meals on the first day of the week. There are plenty of plant proteins, if that’s a concern. One you may be familiar with is quinoa, but lentils, green peas, and tofu are all tasty and filling options. Another is adding a handful of almonds to a rice pilaf. Employees can choose from a wealth of all-plant recipes on the Zipongo Mobile app. 2. Healthy Recipe Contest—Organize a healthy recipe contest among employees. Have your workplace VIPs judge the results and share the winning recipe on your employee homepage or newsletter. Post a link to a list of healthy recipes for those who need fresh ideas. Here is the Zipongo Mobile app for a rich library of flavorful options. 3. Healthy Potluck—Get your team to organize a healthy potluck, and remember to make sure each of the food groups is represented. In need of a few healthy potluck ideas? Try broccoli-bacon salad, three-bean salad, sesame chicken cucumber noodle salad, or sweet potato mac and cheese. 4. Coupon Distribution—It’s hip to save. Give away discount coupons for a healthy meal featured in the cafeteria or vouchers for nutritious beverages or snacks. You can make a simple coupon at Sendacoupon.com or Canva. 5. Cafeteria Taste Test or Breakfast Bar—Host a formal taste testing of new healthier versions of recipes being considered for your workplace menu. For inspiration here’s a sampling of what top companies are feeding their employees. Just as fun could be a free, healthy breakfast or lunch bar in the company cafeteria. It builds good will, and it emphasizes how much the company values nutrition and wellness. 6. Lunch and Learn—Invite a nutrition or wellness expert to teach a session for employees on healthy eating. Arm them with life-changing skills with topics like “Danger in the Aisles? Safely Navigate Your Grocery Store,” “Live Healthier with Food as Medicine,” or “How to Make Healthy Food Choices Stick.” Encourage attendance with a prize drawing. After this effort, you may find nutritious foods are so popular, employees will be asking for more. 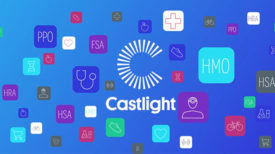 Nutrition is an essential element of a successful corporate wellness program, and Zipongo is pleased to partner with Castlight to connect employees with health and wellbeing programs that help them get healthy and stay healthy.